Medina and Sons’s shows what people are saying about us and our landscaping services in Highwood, IL. Please read through some of the letters Medina and Sons has received from our satisfied customers. We believe it's important to hear what our customers have said about our work before you choose us. If you require more information, please contact us and we'd be happy to provide additional references for our work. "After years of disappointing landscape services my husband and I have found a company we can highly recommend. Owner Steve Medina answers phone calls and emails quickly and comes out to the property in a timely manner. He is polite, knowledgeable and actually does what he says he will do. 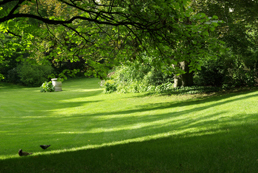 Our gardens and lawn have never looked better." "Conscientious, hardworking, knowledgeable and respectful, all describe Steve Medina's work ethic. We have used several landscaping companies in the last 20 years and Medina & Sons delivers on service. Steve is always accessible and prompt in his response to any requests. We trust Steve's judgment and appreciate the job he and his staff provide." 1. Steve Medina. As president of Medina and Sons, Steve takes great pride in how your property looks. He is always available and personally answers your phone calls. If you have a special project, he is always very accommodating. We never have experienced such "hands on" service from our previous landscapers. Most every week Steve stops to look things over to be sure that nothing is overlooked. 2. The Crew. Each week the same crew takes care of your property. They become very familiar with how you want things done and they work hard to see that it looks wonderful. They know what they are doing and it is obvious that they take pride in their work. 3. Medina & Sons is small enough to offer personal attention, yet large enough to handle the complete care of your property. Besides the weekly maintenance, they take care of the fall and spring clean-ups, fertilizations, weed spraying, aerations, perennial care and shrub pruning and trimming. In addition to this, we have hired them to plant at least a dozen trees over the years, some spruces as big as 14-16' tall. Most every year we have had them add to our landscaping plan with a good number of shrubs. If you need some shrubs or small trees transplanted, they can accommodate this request as well. Our wooded home site is about 1.8 acres and we have enjoyed seeing it develop so nicely. Steve is more than willing to offer advice on tree, shrub & plant selections and he has great ideas. 4. There are landscaping companies and then there are professional landscaping companies--Medina & Sons is the latter. The crew comes dressed in matching uniforms and their trucks and equipment is always clean and well maintained. In addition, they have the expertise to successfully accomplish any planting or hard-scape projects you may envision. We are happy that Medina & Sons represent us in our neighborhood. We wholeheartedly recommend Medina and Sons and would be pleased to speak with anyone needing a reference as to his services and work ethic." - Doug & Joyce R.
"We have been working with Medina and Sons for over 5 years now. In terms of value and service, we have found Medina and Sons to be unparalleled. Steve's team does a wonderful maintenance program that keeps our landscaping looking beautiful. In addition, they work seamlessly with me when I have a new project that I want to do in my yard. The thing that impresses me the most about Medina and Sons is the responsiveness we get when an issue arises. I have never had to wait even 1 hour for Steve to get back to me and he usually simply picks up his cell phone. He has lifted and tethered fallen trees, fixed our mailbox, moved outdoor furniture for a party and done emergency drainage work.These are but a few examples of how Medina and Sons is not your average landscape company. Steve goes way above and beyond! He is highly skilled at what he does and is incredibly responsive in every aspect of his service." "We have used Medina and Sons for about 10 years, and they provide excellent service at a fair price. Steve is great to communicate with and will come around immediately to talk about landscaping changes.His annual proposals are very complete and professional. Bushes are pruned, Trees are trimmed, beds are neatly edged, weeded and cultivated. The grass is fertilized and evenly mowed, and the gravel driveway immaculately raked. Steve provides extra services such as mulch, bark and plantings in a timely manner. Our acre of land always looks great!" - Stephen & Carol S.